On 7th June 1944, Bayeux became the first European city liberated in the Battle of Normandy. Its liberation was the objective of 50th Northumbrian Division. On 7th June 1944, Bayeux became the first European city liberated in the Battle of Normandy. Its liberation was the objective of 50th Northumbrian Division who had landed on Gold Beach. By 0830hrs on 6th June 1944, 151st Brigade reconnaissance patrols scouted the outskirts of Bayeux. They spent the night in the suburbs of Saint Sulpice. Imperial War Museum Photo: B 5685 (Part of the War Office Second World War Official Collection). 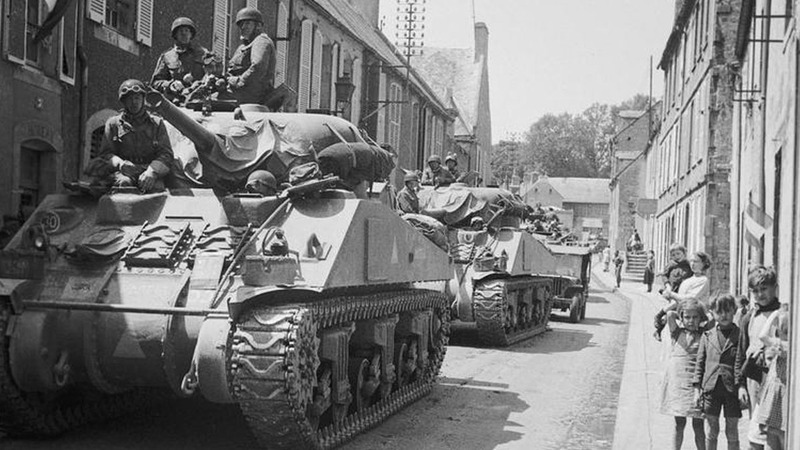 Sherman tanks of the British 30th Corps pass through the narrow streets of liberated Bayeux in Normandy 0n the 8th June 1944. By 1200hrs the following day, the 56th Brigade’s tanks and soldiers arrived met with light German resistance. General Kraiss had moved his forces of the 915th Regiment towards the Cotentin Peninsula. His plan was to head off American troops but on hearing of the British approach, he moved back towards Bayeux. The men of the 50th Northumbrian are remembered on a plaque opposite the city cathedral. To the glory of God and in memory of all ranks of the 50th Northumbrian Division who laid down their live for Justice, Freedom and the Liberation of France. In the assault on the beaches of La Rivière, Le Hamel and Arromanches on the 6th June 1944 and in Battle on the field of Normandy. The town of Bayeux, the first town in France to be liberated by the Allied armies was entered and freed by troops of this division on the morning of 7th June 1944. Kraiss eventually withdrew his men from the Bayeux area entirely. Local resistance operatives managed to notify the Allies who halted a planned bombing campaign. Pockets of enemy resistance remained to the north of the city at Sully and Port-en-Bessin. Close range fighting broke out between them and 56th Brigade and the 5th Royal Tank Regiment. Four 88mm guns, one 75mm gun, and one self-propelled 30mm were destroyed. On 14th June 1944 Charles de Gaulle made the first of two famous speeches in the city. Here, he made it clear that France was on the side of the Allies and re-established Republican Law. He appointed Francois Coulet as Head of the Civil Administration as the liberation of France began. After liberation, Bayeux became an important strategic post for the Allies. Situated close to the landing beaches, it allowed thousands of soldiers and vehicles to pass through. Even now, the narrow roads of the city prove difficult to navigate. Allied forces found themselves building the now famous Bayeux Bypass to get around the city. Having escaped bombing during its liberation, Bayeux was one of the few cities with an operational hospital. It treated injured soldiers as well as fleeing refugees. More field hospitals sprung up in the area, helped by the infrastructure and transport links. For the rest of the Battle of Normandy, Bayeux was a hospital town. Today, the medieval architecture still stands proud in Bayeux. The liberation was such that the city escaped Allied bombing. The German troops were more occupied with defending nearby Caen. 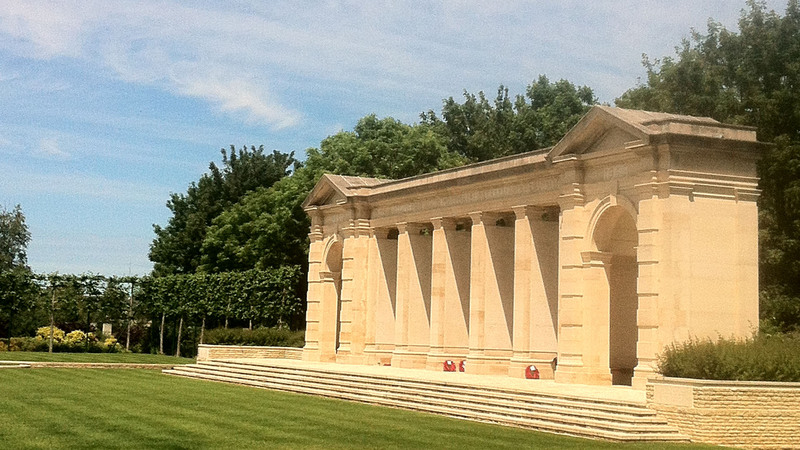 The Bayeux War Memorial overlooks the Commonwealth Military Cemetery on the outskirts of the town on Bayeux. Photo taken on 8th June 2014. Despite the relative ease of liberation of Bayeux, many thousands died in the Battle of Normandy. Bayeux holds the largest British World War Two cemetery in France. An inscription at the military cemetery echoes the history of William the Conqueror, the Norman who became king of England in 1066. No a Gulielmo victi victoris patriam liberavimus. The Latin reads: We, once conquered by William, have now set free the conqueror’s native land. If you enjoyed this post on "Liberation of Bayeux", please share with your friends and followers. Private First Class Jack Agnew became part of one of World War Two's most infamous US Army units but the paratrooper was born in Belfast, Co. Antrim. 'We Fought On D-Day' was a documentary produced by BBC Northern Ireland and Doubelband Films telling the stories of 1st Battalion Royal Ulster Rifles. Members of today's armed forces return to Cambes Wood, Normandy, exploring the role played by Royal Ulster Rifles after D-Day during France's liberation. Sergeant William Charles Morris died on 14th July 1944 after sustaining shrapnel wounds a few days earlier during fierce fighting in the Battle of Normandy. Rifleman George Anthony McCracken from East Belfast, Co. Down died on 21st June 1944 after sustaining shrapnel wounds near Bayeux, Normandy, France. Corporal Hugh Brown served in 2nd Battalion Royal Ulster Rifles during World War Two, landing on Sword Beach on D-Day, 6th June 1944 and fighting in France.